Rarely one to say no to chocolate, especially to chocolate that promises to be of a particularly good quality, I was looking forward to receiving a review box from Club Chocolat Français. Club Chocolat Français is a family owned business in the South West of France producing handmade chocolates. Ingredients are sourced as locally as possible and the chocolate comes from Rainforest Alliance Certified farms in countries from Ecuador to Ghana. New to the English market they have recently launched a UK website. Their intention seems to be to run the club along similar lines to Hotel Chocolat. In this case a monthly box of 34 chocolates are sent out to members along with an invitation to submit tasting notes and suggestions to help inform future products. 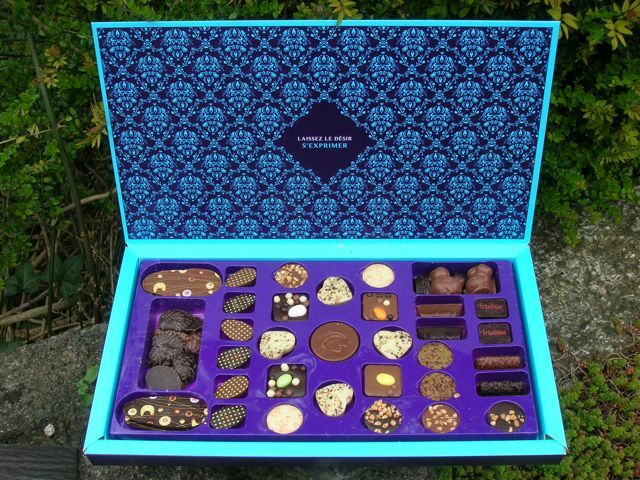 When opening the box rich & heady aromas of chocolate and nuts assailed my nostrils – pure heaven. What met my eyes, one month after Easter had passed, were a number of chick, rabbit, hen and egg shapes which I found somewhat surprising. Oh well, I shrugged and got on with the important task of tasting. Thankfully, I was not disappointed by the quality of the chocolates; pure cocoa butter and no artificial additives here. They tasted of real ingredients and had satisfyingly nutty and fruity flavours. Although the majority were pralines of one sort or another, they were all quite different. There were also a few fruit purees, including strawberry and passionfruit with the raspberry covered in dark chocolate being my absolute favourite. I often find pralines way too sweet, but being French, these chocolates were just the right side of sweet. The textures were varied and made for an interesting mouth experience – some were smooth, some soft, some contained what I took to be feuillitine and others had small nut pieces contained within or on top. Perfection is not easily attained and I have a few quibbles. The first thing I noticed was the size of the box: way too big for our letterbox (standard letterbox size). This brings with it all the difficulties of trying to get hold of your much anticipated chocolates, if you don’t happen to be in when the postman calls. Secondly the “menu” was all in French, perhaps not the best way of winning over English chocoholics. Luckily for me, although rusty, my French was just about good enough to make it out. The next area where I came unstuck (or do I mean stuck?) was when I tried to get the chocolates out of the box. This proved to be no mean feat, especially as I was trying to extract them for photographic purposes. My conclusion is, therefore, that some work is needed to improve their packaging. Although, the chocolates were indeed of a high quality and were quite delicious, I felt their flavours were somewhat conservative. Our palates have become increasingly sophisticated and many of us like to explore more exotic flavours. such pretty chocs… such a hard job to do… I love your leaf bowl too! Dom, thank you. The bowl is made out of a coconut shell – works really well. Thank you Alida – they were indeed a lovely treat. Lucky you so many and so pretty. Yum! Thanks for an honest review. They sound a little too indulgent for me unless someone buys me a subscription but they do look good! I love chocolate but these are too expensive – especially for just a French menu! Now they do look awesome!